On the 4th of March 2019, Turkmen delegation headed by the Minister of Foreign Affairs of Turkmenistan took part in the four-sided meeting of the Ministers of Foreign Affairs of Turkmenistan, Azerbaijan, Georgia and Romania on the Project of creating international transport corridor “Caspian Sea-Black Sea” that was held in Bucharest. The issues related to the establishment of new transport-transit corridor that is a vital component of such geographically important route of economic cooperation as the “East-West” were in the Agenda of the special meeting of the heads of the foreign policy agencies. In this regard, the ministers discussed new opportunities of cooperation with all the stakeholder sides, including the European Union. As a result of the meeting, the participants adopted the Bucharest Declaration. The same day, there was a meeting of the heads of the foreign policy agencies of Turkmenistan and Romania in the Ministry of Foreign Affairs of Romania. During the negotiations, the sides exchanged views on the present conditions and perspectives of developing Turkmen-Romanian relations in political-diplomatic, trade-economic as well as cultural-humanitarian spheres. 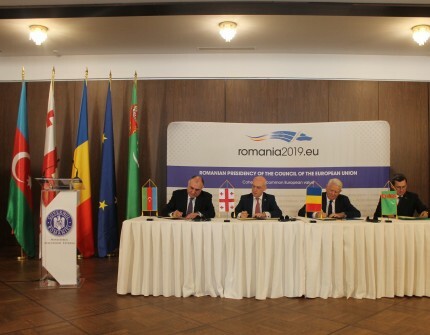 Also, during the meeting the current issues of international agenda including partnership in the framework of international organizations, activating the relations in the “EU-Central Asia” format as well as the current chairmanship of Romania in the Council of European Union in the first half of 2019 were discussed.